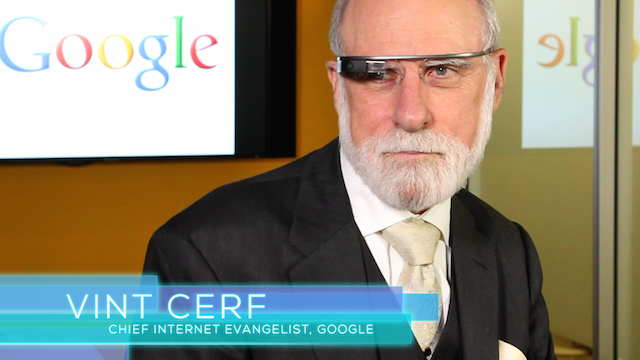 Vint Cerf, is one of the co-inventors of the Internet. Currently, he serves as the vice president and Chief Internet Evangelist for Google where he is responsible for identifying new enabling technologies and applications on the Internet and other platforms. Widely known as a “Father of the Internet, ” Vint is the co-designer with Robert Kahn of TCP/IP protocols and basic architecture of the Internet. In 1997, President Bill Clinton recognized their work with the U.S. National Medal of Technology. In 2005, Vint and Bob received the highest civilian honour bestowed in the U.S., the Presidential Medal of Freedom. Vint is co-founder of the Internet Society (ISOC). He also served as president of ICANN, the organization that operates the domain naming system. Vint holds a Bachelor of Science degree in Mathematics from Stanford University and Master of Science and Ph.D. degrees in Computer Science from UCLA. He has received more than a dozen awards and honorary doctorate degrees from all over the world, some of which come from: Switzerland, Sweden, Spain, the Netherlands, Italy, China and Canada. At the start of his career, he was a program manager for the United States Department of Defence Advanced Research Projects Agency (DARPA), which funded various groups to develop TCP/IP technology. TCP/IP made possible Wi-Fi, ethernet, LANs, the World Wide Web, email, FTP, 3G/4G ― as well as all of the inventions built upon those inventions. When the Internet began to transition to a commercial opportunity during the late 1980s, Vint moved to MCI (an American telecommunication company) where he was involved in the development of the first commercial email system connected to the Internet.